NPR News Nuggets: Cracker Barrel Super Stars, A Car Scavenger Hunt & Butter Here's a quick roundup of some of the mini-moments you may have missed on this week's Morning Edition. You butter believe that people make sculptures out of the same stuff you put on your toast. In 2011, the Pennsylvania Dairy Industry rolled out their 1,000-pound "Butter Sculpture" depicting a dairy farmer providing milk to children playing. Metallica rocks, but losing your car does not. As Morning Edition host Rachel Martin said on Monday, one New York teenager experienced both extremely emotional events within hours of one another. Gavin Strickland was in such a rush to get to the Metallica concert in Toronto that when he drove into the city, he hurriedly parked his car and took off to hear the music. He didn't pay much attention at all to where he parked, so when the concert was over Strickland left only to wander around the city for hours. Why? Because he had no idea where his car was. As CBC News reports, the teenager spent days looking for his car before returning home. Strictland did remember a few details, so his parents took those and made an ad on Craigslist asking for help. With clues, including that the garage was near a Starbucks and parked on the ground level, Toronto resident Madison Riddolls set out to find the car like it was a scavenger hunt. Eventually she did find it and Strickland was reunited with his Nissan Versa. There is absolutely no question about it. Hot dogs are not sandwiches. If you are unfortunate enough to have made that terrible mistake before, you're not alone. As Morning Edition host Rachel Martin said on Tuesday, The Courier-Journal in Louisville, Ky. has made the mistake many times before, but the staff is finally owning up. The paper issued a correction that notes every time dating back to 1887 that a hot dog was incorrectly referred to as a sandwich. In the correction The Courier-Journal notes, "Among those errors were references to a frankfurter sausage sandwich, frankfurter sandwich, coney island sandwich, frankfurter sandwich with mustard, and, the most egregious, a frankfurter sandwich with catchup. We deeply regret the errors, especially that last one." We regret that last one too, but applaud you for your commitment to setting the record straight. Now let's hope everyone knows the acceptable toppings to put on a hot dog. Butter sculptures are not limited to Ohio. 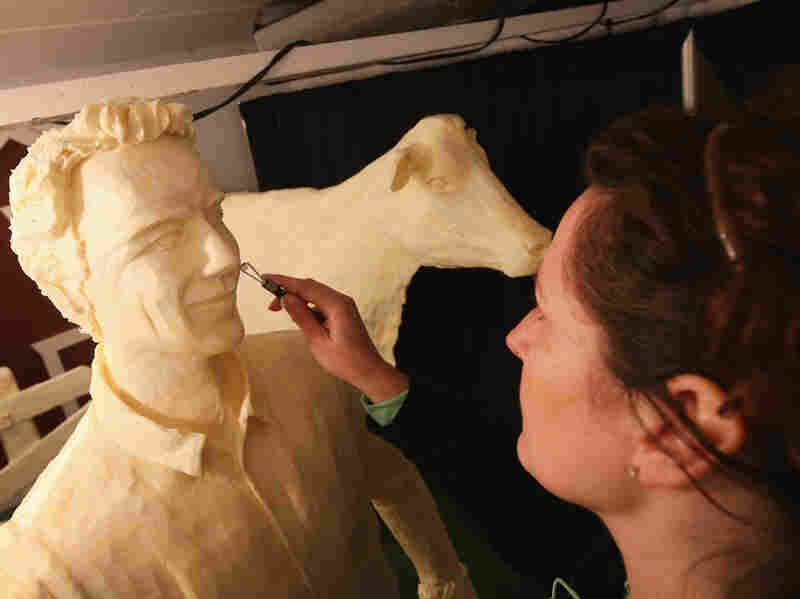 At the Iowa State Fair in 2014, artist Sarah Pratt sculpted a statue of Kevin Costner as Ray Kinsella, a character in Field of Dreams out of butter. Forget those fake spreads, can you believe this is butter?! As Morning Edition host Steve Inskeep said on Wednesday there is no limit to what you can achieve once you have 2,000 — yes, with three zeros — pounds of butter. In fact, if you've got the skills, you can create masterpieces with butter as your medium. In the case of artists who participated in the annual butter sculpture event at the Ohio State Fair, a masterpiece constituted as a 6-foot-tall bottle of chocolate milk. Technically, it's chocolate milk made of butter, but isn't that even butter? 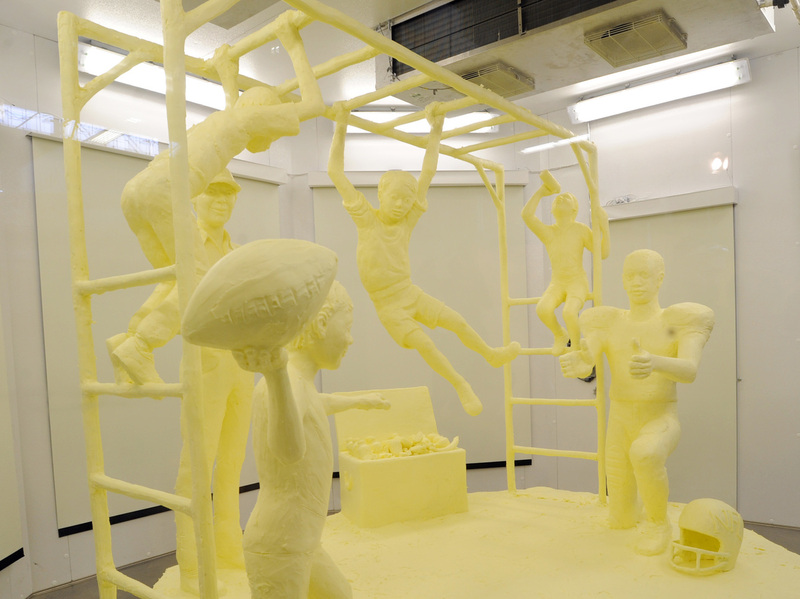 So to recap, you can create anything out of butter if you have 2,000 pounds of it. If you don't have access to that, well, why not try to visit all 645 Cracker Barrel locations? Granted, if you do try this, I have to tell you, you're already way behind. That's because, as Morning Edition host Rachel Martin said on Thursday, Ray and Wilma Yoder are one visit away from having gone to each location. As The Lebanon Democrat reported, "The quest to visit every Cracker Barrel store started 40 years ago when Ray Yoder worked for Coachman delivering recreational vehicles across the country." As anyone who's gone on a road trip knows, Cracker Barrel restaurants are often located by interstates. Ray, 80, told ABC News that he's never had a bad experience at one of the restaurant's locations and that he "always walks away refreshed." What's even better about this impressive feat, is that Cracker Barrel knows the Yoders and staff members welcome them when they arrive.